LEAPâ„¢ is a content editor’s dream (CMS), a designer’s best option, and the perfect framework for site development. You can add a Page at any point in your website management process - whether the page is linked to from your menu or not. You can create all your pages first, or all your Menus, or you can wait until the Menu and Design are in place, and progressively add pages to suit. One of the most common stumbling blocks to efficient website management is poorly formed URLs. A poorly formed URL will sometimes load incorrectly, and may also not be read correctly by search engines - decreasing the chance of people finding your site in a search. 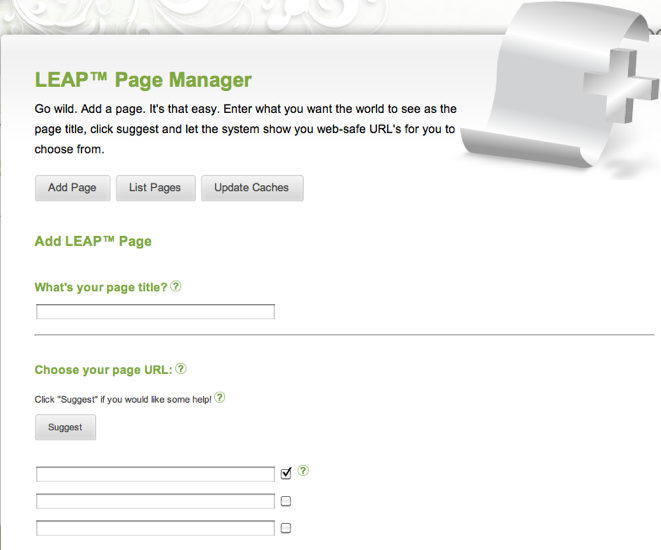 LEAP™5 is designed to make optimizing for Search Engine ranking easier and one way this is done is by suggesting page URLs for the title you want. the page that is created shows the full descriptive title that was entered, with a suggested shortened URL. if you want the page live immediately - don't forget to go to Page Manager, List Pages and click the 'Live' button.